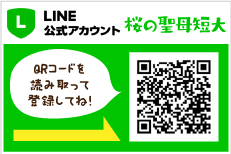 【聖母アワー】Don’t be passive, be creative! 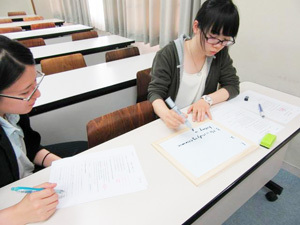 During today’s class in Seibo Hour, students who will take the transfer examination of four-year universities did exercises in English compositions. 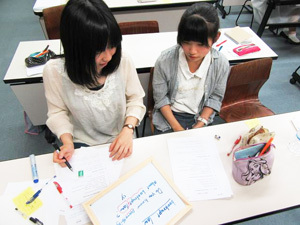 Many students often feel difficulty when they make some English sentences, and give up dealing with them. However, he said the most important thing was stop complex thinking and start thinking simply. Because the more you think complexly, the more difficult it becomes. So the students did exercises without using dictionaries or electronic devices! By doing this, they could shift their mind from complex to simple. Instead, they made pairs, exchanged opinions, and helped each other. After answering questions, Mr. Andrew went around each group and checked the answers. Wow! Every student did a great job! 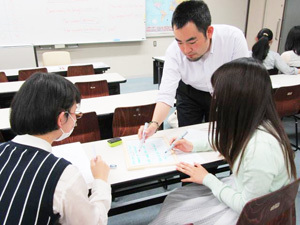 There are several correct answers in English composition so they can learn many things from not only a teacher but also classmates. This was the dynamics of the classroom. 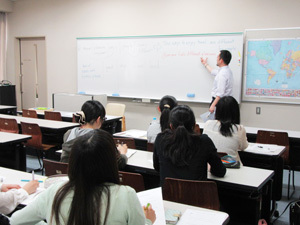 We could find the class was full of enjoyment and excitement.